In the previous two chapters, I introduce the Spanish side of my heritage by introducing the two men, who in my mind, are key figures to understanding my family history. While I focus on many historical facts and references in these chapters, I am strongly reminded that it is the stories told by our family that have taught me the most about these two particular men. It is the timeless power of storytelling carried on in intimate family settings and shared with endearment, that connects me very deeply to our family legacy. There is a flow to it; a way of having heard it and embraced our stories, from which I am now familiar with it as part of my own being. In this manner, I share it with you. 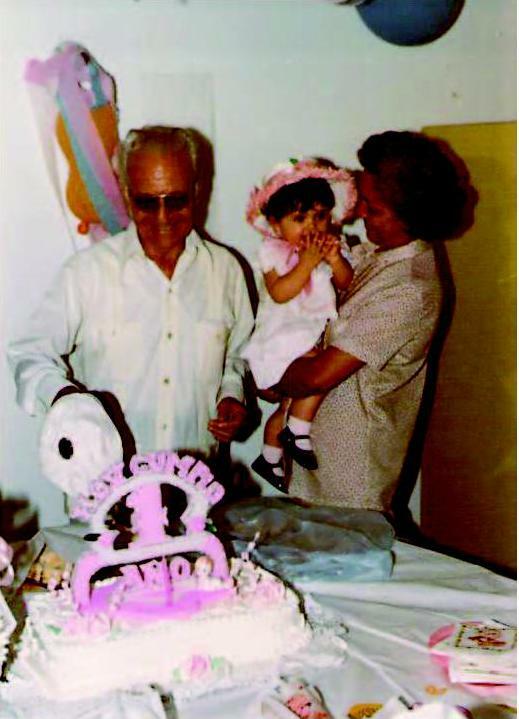 Above Image – My first birthday with my abuelito and abuelita in the Dominican Republic. I knew my abuelito (grandfather) quite well while I was growing up. When I was 7-years old, he passed away. Yet the connection and love I had with him while he was alive still carries on now, I believe even from the other side. As I became older, my mother and her family told me more stories of him. He had grown up among eight other brothers and sisters in the small parish of Tuna in the region of Asturias in Northern Spain. This is where our family of del Riego was from for several generations and even home to my 4th great-uncle, General Rafael del Riego. My mother always loved highlighting details that I found fun in my younger years. The ways of his life, like the vineyards they had and how they would make wine by stomping it with their feet, were fuel for my imagination and love for history. I grew up playing guitar and singing, just as my mother did, and had an understanding that it was a family trait – my abuelito loved music even as a child and was a wonderful piano player. Even though he loved playing the piano and deep down inside dreamed of doing what he loved for his profession, his father insisted that he become a lawyer for the honor and success of the family. So my abuelito did what was expected of him and became a lawyer of the State. He also served in the army during the Spanish Civil War. These were very dark years where he had to do things he did not want to do and he witnessed and suffered many things that would always remain with him. At one point, he was captured and imprisoned in a concentration camp in the Pyrenees Mountains along the French border with Spain. With the help of some friends, my abuelito escaped on foot. When I was older, my abuelita recounted to me that even into his old age, he would sometimes wake up screaming from night-terrors and dreams, seeing once again the horrors of what he lived through. Since he was a lawyer of the state for the Democratic Republican government, he barely escaped with his life when the Republican government fell at the conclusion of the Spanish Civil War. From what I have learned, over twenty lawyers of the state were at that time round-up and executed by Francisco Franco, the then victorious dictator of Spain. My abuelito, Jose del Riego Orozco, was able to board a French steamer that left Spain with hundreds of Spaniards who were also refugees. I have been told that the ship stopped at more than one port along Europe and in its area of destination, the Caribbean. It was at Santo Domingo in the Dominican Republic that my abuelito disembarked. When he landed there, it was late 1939 and the capitol city was then called Cuidad Trujillo, after the dictator of the time, Rafael Trujillo. My abuelito and family had escaped one ruthless dictator, only to find refuge among other. In this new land, Jose del Riego Orozco would begin not just a new chapter in his life, but an entirely new life for him and our family. Read what’s next in my blog series, “The Chronicles of Heritage”.